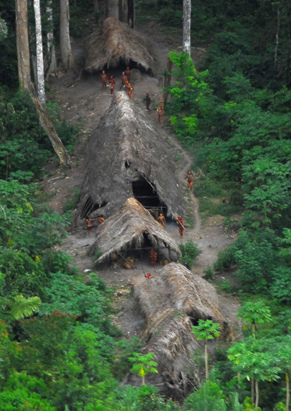 According to the Associated Press on Thursday Brazil has released photographs of one of their last uncontacted indigenous tribes located in the far western Amazon near the border of Peru. Roughly a dozen Natives were photographed in the Jungles of Brazil amongst six grass huts. The stories claim that Anthropologists have known about this tribe for some 20 years. I immediately have to wonder if this is the same tribe that Sydney Possuelo spoke about in National Geographic in 2003 whom he called the Fletchero, or “arrow makers.” I’m inclined to make an educated guess and say that they are. The pictures show a half dozen or so men in red paint shooting their arrows at the aircraft as it flies overhead. Beside them in a couple of the pictures are two other people wearing black paint. The men in red are obviously the community’s warriors. The two people in black are women. In 2003 when Possuelo spoke to National Geographic about the Fletchero, he theorized that they, like many other Amazonian Indians may in fact be the descendants of refugees of European expansionism who fled the Spanish invasion for homes deeper in the jungles. If this is true, what must these natives think about the outside world? As we know Native peoples maintain their histories for countless generations in oral traditions and folklore. When they teach their children about the outside world do they recite the Native experience as we know them to be? I wonder if they recount the horrors experienced by their ancestors at the hands of the corrupt conquistadores and the deadly diseases unleashed against their people. Is it any wonder that they shoot arrows at the strangers who buzz their village in a huge mechanized monster bird? What legends, warnings and taboos have grown up around this tribe’s choice to exclude themselves from interaction with the outside world? 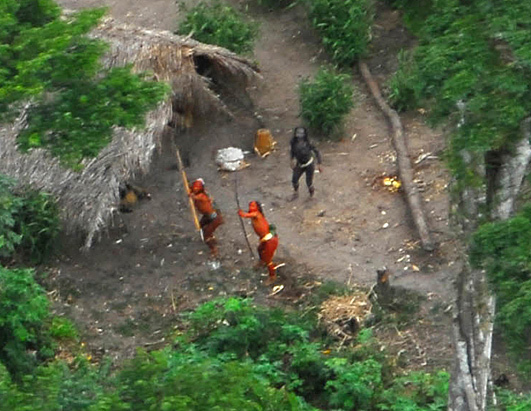 First contact is often completely catastrophic for “uncontacted” tribes. It’s not unusual for 50 percent of the tribe to die in months after first contact … They don’t generally have immunity to diseases common to outside society. Colds and flu that aren’t usually fatal to us can completely wipe them out. As an Indian, mixed-blood as I may be, I feel great joy in knowing there are a few of us left who still live the old way. But I also feel great sadness over this because I realize just how few of them there really are … what maybe a few dozen?